It’s a mistake, when life hands you a tough lesson, to think that you can get back at life by not learning it. Man’s mind, once stretched by a new idea, never regains its original dimensions. What if you woke one morning (or one afternoon, depending on how late you were out the night before) and your internal browser — the browser which loads pages in Telephone Agent — was suddenly not compatible with several web pages? Have no fear — the system field variables are here! A quick and easy way to work around the limitations of the internal browser in Telephone agent is to use a system variable to point to the browser you wish to use instead. Create a system field variable called "Browser" and assign to it the command necessary to start up your favorite browser. 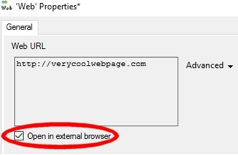 Then, in your script, when you're launching a web page, tell the system to open the page in an EXTERNAL browser. In the field where the external browser is to be specificied, insert this system field variable; and bingo-bango-bongo — you're browser is back in action! The only caveat here is that each machine requiring the browser you wish to use must have that browser installed. Once in a while, we do run into unexpected issues with Telephone Agent and IS. This particular issue is very easily handled. Just follow the preceding instructions and "Bob's your uncle!" The Future Directions Committee has asked me to talk about how best to help in conversions from Infinity to IS and from IS to IS CBA. So you have decided to take the plunge in to IS Scripting and using Contact Based Architecture!!! This can be perceived as a daunting task. Take things one step at a time and have a plan. To quote Theran Mossholder, “Templates!”. Scripting and setting up directories and on-call are truly sets of building blocks. The directory can be based on a template. The script can be based on a template. The on-call can be based on a template. The client information pages can be based on a template. Templates are there for a couple of very important reasons. First is consistency and second is consistency. Consistency helps in so many ways. It helps the operators. If the scripts look the same, “talk” the same and act the same, the operators will learn and know these features at a much quicker pace than if you have each script look a little different. Have a plan! If you don’t have a plan, develop one. Add the directory and on-call in IS for all accounts to get the operators used to accessing the information. If you choose to give them access to updating this information, also get them used to making changes. Add a dispatch screen without CBA to all scripts to get them used to being in the script while they are dispatching the call. Maybe have the instructions in the screen or pop-up an InfoPage. When all above is done, you can then script to the directory and on-call schedules so that the operator does not have to worry about bringing up the directory and on-call to dispatch it. The script will tell the operator and guide them. This would make the account CBA capable. Add the directory and on-call to one account in IS. Which means adding the dispatch screen and it would be fully CBA capable. Put a script in place just to capture the information. Then go back and add the directory and on-call. Then script to the directory and on-call. Add the dispatch screen to be CBA. Because I was already 100% IS Scripts, I added a dispatch screen that was very much like the CBA dispatch screen I had created... but without the CBA. This made the scripts fairly consistent. The operators knew that if they wanted to do something with the message, they would have to Resume Dispatch. If it was CBA there was a button for them to use to Contact. If there was no Contact button they knew they had to go to the on-call schedule. Next, I went through and built all of the directories and on-call schedules in IS. All of the “unconverted” accounts were in Infinity OnCall and Infinity Directories. Finally I updated the dispatch screen to connect to the directory and on-call. This plan was much more successful. The fact is, I had a plan. The scripting for CBA using templates is easy once you have your templates ready and in place to use. It is getting your templates in a state where you can rely on them. It may take some time to develop the templates — but when you do have your templates, building accounts is so much easier if everything is built almost identically. Example: You hand me a HVAC account where I am to contact 3 people until I get someone on the phone. The script and the on-call could be done in less than half an hour. Take your time on your templates. Nothing worse than having a template you thought was “canonized” only to find out that you had something wrong in it and you had to touch 1200 accounts to fix it. There is no race to win to get to the end result. Yes, we want things done sooner than later, but things could get done much later if you have messed up your template and have to touch all the accounts again. The templates can be anywhere from a full account script template or a Master Template that has everything but the message screen in it, and I mean everything. Basically I have the building blocks for almost 95% of the new accounts in one script. I just need to drag and drop the elements in to the new script. Not everything that is in this Master Template is ever going to be used it one script. In short, I want to use the age old adage to “work smarter and not harder.” There are resources to help you. Remember, you are not alone. Many have created and followed plans before you; some are doing it as I type, and there will be people doing this in the future. NAEO is definitely a resource that is literally at your fingertips. Ask questions on the list serve. If you have/had a buddy at an NAEO conference, ask them. Find out what works for you and your operation and go with it. The NAEO conference is never to be missed — and this year was no exception. 160 Members and speakers enjoyed the Waves of Change and Oceans of opportunity that were presented at the 2016 NAEO Annual Conference in San Diego at the beautiful Mission Bay Hilton resort and spa. Twenty-five members got an early start on learning by attending the Advanced Technical Workshop on Sunday. This was a hands-on program focused on database integration through SQL, taught by industry leaders Jake Phillips, Rossi Fraenkel, Adam Haines and Susan Kirkpatrick. The learning continued that afternoon with Amtelco University where attendees had the opportunity to learn tips and tricks for maximizing the use of their Amtelco systems. First Time Attendees were warmly welcomed by the group at the opening reception Sunday evening; it may have been a bit cool outside but the fire thrower and Polynesian dancers warmed things up quickly. Veterans and newbies alike enjoyed the West Coast hospitality and enjoyed a chance to meet new people and reconnect with old friends. NAEO was fortunate enough to be joined by two keynote speakers this year, each of whom greatly enhanced our conference. Colin Sprake from Make your Mark had two presentations, the first on Building your Business and the second on Sales and Marketing. Our second keynote, Michael Gunther from Collaboration Business Consulting, enlightened us on Building a Collaborative Workplace. Both were very well-received by attendees. This was a big year of recognition for many NAEO members who have contributed their time, thoughts and effort towards building this association. Honored this year at the conference were Tom Curtin as the Amtelco Employee of the Year; Lisa Philips of Stericycle received the President’s Award; Kevin Procter from Extend Communications was the Christina Collins Scholarship Winner; and Brian Doherty of Crocker Communications was the Curtin Scholarship Winner. Also inducted into the NAEO Hall of Fame this year were two great members; the first was Tom Gelbach, who will be missed but never forgotten. The second was Kurt VanderScheer. And last but certainly not least, we introduced an NAEO Honorary Society for those members who are not in the industry anymore, however have given their lives to our industry. 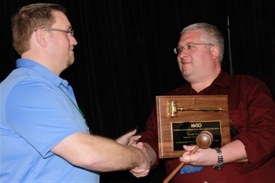 Jim Marchbank and Doug Swift both became our first honorary NAEO members. Congratulations to all. At the business meeting Tuesday, Robert Donnelly and Kurt VanderScheer ended their terms on the NAEO Board of Directors. Robert Bennett was re-elected to serve on the board, and Ian Cook and Rossi Fraenkel were elected to their first terms on the board. 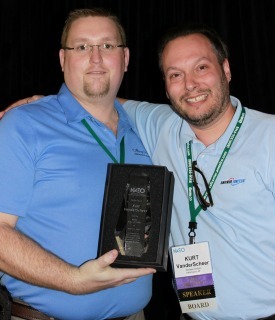 Gerald Brosseau, II, outgoing president, passed the gavel to our incoming NAEO President, Theran Mossholder. 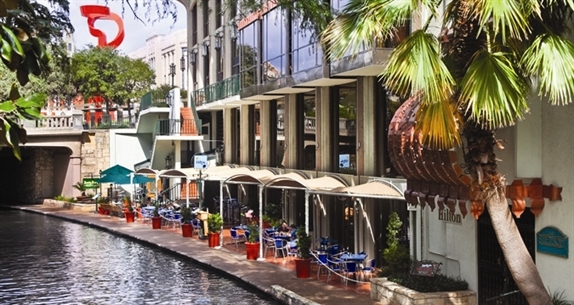 at the Hilton Palacio del Rio Hotel in San Antonio, TX! We would love to have you join us March 12-15, 2017! Last year, I was blessed to be awarded the 2014 William and Eleanor Curtin Scholarship by the NAEO Board of Directors. I used this scholarship to attend the NAEO Annual Conference in Orlando, Florida. As this was the second NAEO Annual Conference I attended, I learned a lot of valuable information that I can apply towards my career goals at Advantage Answering+, which are to develop and hone my programming skills in an environment that is forward‐thinking and committed to excellence, while aligning the efforts of our team and working towards making the world a friendlier, more connected place. Maybe it’s the fact that I normally don’t attend conferences very often, especially those in which I am surrounded by business professionals and industry leaders in the same trade as myself, but the entrepreneurial spirit in the Rosen Shingle Creek Hotel was unmistakably palpable. On an emotional level, I experienced a plentitude of feelings: Intimidation, motivation, curiosity, excitement, happiness, and innovation — all due to the myriad of experience levels among my peers. There were NAEO veterans, who were very experienced with Amtelco products and have been to their fair share of conferences. Industry leaders, while very knowledgeable were very approachable, down‐to‐earth, and relatable. On the flip side were the “first timers” who were attending this conference as their first NAEO soiree. In a group of strangers, I felt a sense of community and camaraderie; even though we didn’t know each other, we had NAEO as a commonality, as well as our curiosity and eagerness to learn more about their products, so we can learn new things and bring back tools and tips to positively affect our business. Regardless of one’s skill level, we were all there to support each other and learn new developments in the industry. Because NAEO provides many different platforms, each attendee and their respective company utilize the software differently, which contributes to a “melting pot” of experiences to group discussions. Each attendee has their own strengths and contributes to the industry in some way, be it big or small. 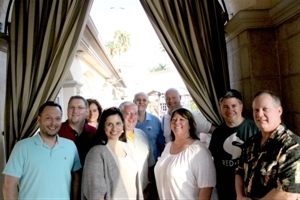 Attending Conference to catch up with old friends and having the opportunity to make new ones was significant to me, not just for having people to go dancing with at Jimmy Buffett’s Margaritaville at Universal Studios, but also in relation to networking. After I left Conference last year, I reached out to a few peers for assistance to see if they could educate me with some programming I wasn’t sure how to execute, and sure enough, they were able to assist. It’s very comforting as a programmer to know that if you don’t know the answer, you have made connections with those in the industry who are available to help. NAEO fosters an environment of support, which I have definitely utilized a lot this past year, especially after taking on more equipment‐related responsibilities. It makes me feel more secure and happy that my friendly NAEO peers and mentors are always able to assist if I need, and vice versa. Running a Successful Multigenerational Call Center (Desiree Bombenon from Securecall Contact Centers, LTD): She brought to light that there are least five different generations of people in each office, each with different motivations and challenges. The goal is for all generations to exist harmoniously for the success of the business. The breakdown of what’s important to each generation was very eye‐opening for me, as this is something I don’t normally think about to this degree. From Lead to Cancellation: How Efficient are Your Processes? (Bryan Weinstein and Joe Pores from Call 4 Health): They stressed the importance of tracking and following up with potential clients. I can speak from personal experience that clients love when you follow up because normally, most people forget or say they will and don’t follow through. It’s important to be people of our word, and this is crucial to building a relationship based on trust with clients. Net Promoter Score: Building Amazing Customer Relationships and Profitable Growth (Lisa Phillips and Ron Waine from Stericycle Communication Solutions): We want to know how our clients are feeling and act accordingly; if clients no longer see us as an expense and we can focus on growth, or if there is something we can do to improve the services we provide. It takes more than just the initial setup of an account to keep a client happy, and it’s our responsibility to ensure their happiness with our product. What’s nice about all of the breakout sessions (as well as the Conference as a whole) was that NAEO constantly asked for feedback, and wanted to know what each individual thought of said presentations, and were willing to take our opinions into consideration to improve for future conferences. Feedback is very important and it makes me feel like my opinion matters. My #1 goal in applying for this scholarship was to help our organization grow and succeed while delivering custom tailored telephone reception solutions to meet (and exceed) our clients’ needs and goals. Receiving the William and Eleanor Curtin Scholarship was not only beneficial for me personally (its reception instilled confidence as well as the positive reinforcement to confirm that I am exactly where I need to be in my life), but it also benefits both current and future clients of Advantage Answering+. With the information newly learned or fine‐tuned, my dreams of making the Advantage Kickstart Process the most efficient it has ever been is within reach. With the support of my NAEO peers, I’m able to develop the best scripts and programming practices to help our clients achieve their business goals, while making a positive difference in their day. With the information I learned in the breakout sessions, I’m able to maintain and strengthen relationships with existing clients, as well as acquire new ones so we can continue to make the world a more friendly and connected place. This webinar includes set up for Infinity and IS PLUS new 6.5 features coming soon, designed for YOU! Overview of miSecure Messages training and resources, current 6.4 server release, and the very exciting new features coming in the next release, 6.5, which is based on your specific input and needs will also be discussed. Register now! A peek into the future of Amtelco web enhancements with a focus on miTeamWeb improvements and updates, providing a client web portal for IS data and resources including IS messages, IS Genesis call recordings, IS reporting, IS directory, IS on-call scheduling, and IS scripting, from a PC, smartphone, or tablet. Register now! Amtelco is celebrating its 40th year of call center innovations this year. The focus of technology has shifted from hardware in the early days to the advanced software of today. Software technology is much more dynamic and flexible than hardware technology. The pace of change and advancements with software technology is increasing at an exponential rate. As we look at call center technology, we have shifted from racks full of individual computers and servers, each with their own specialized purpose, to a much smaller virtual server environment that has hundreds of times more horsepower and capability than its predecessors. We can now spin up new virtual servers as we need them, with dozens of servers running on a single physical machine. This applies to application servers, web servers, communications servers, and switching servers. Virtual servers can provide an added layer of redundancy and high availability by allowing servers to be easily replicated and moved to another physical machine, either manually while performing a system upgrade, or automatically in response to an outage. The introduction of soft switching provides the ability to migrate call center switching to a virtual environment. Soft switching shifts the control and processing of telephony functions away from hardware, such as the Amtelco XDS Primary Rate ISDN (PRI) and VoIP boards, to the virtual server CPU, with software controlling the CPU. This provides much more dynamic and flexible switch configuration and management. Amtelco’s Genesis platform provides a soft switch, controlled by an ACD and voice processing module within Amtelco’s award winning Intelligent Series platform. Controlling the soft switch functions from within the Intelligent Series provides a single point of administration, simplifying the process of adding and changing trunks, agents, and call behaviors. Genesis combines the flexibility of soft switching with the ease of administration and the power of the Intelligent Series. Soft switching and virtualization open the door to cloud deployment. Cloud solutions such as Amazon Web Services (AWS) and Microsoft Azure are perfectly suited to provide cloud-based call center infrastructure. The entire Amtelco Intelligent Series and Genesis platform can be operated in the cloud at either of these providers’ facilities, or at another similar provider’s facilities. Another major area of call center advancement is system integrations and automation. In today’s world of technology, there is much greater demand for these types of services. Call center clients expect their call centers to automatically integrate to their IT platforms, databases, web sites, web services, and mobile devices. Amtelco’s MergeComm module of the Intelligent Series is built to provide these services. MergeComm is like adding a dispatcher that lives inside your system 24 hours a day, 7 days a week, 365 days a year. 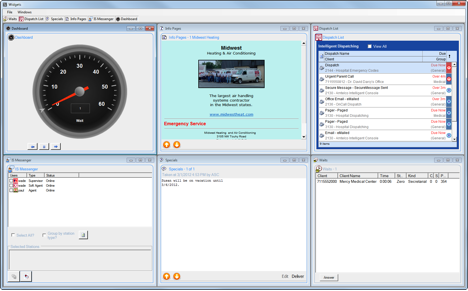 MergeComm dispatch scenarios can run automatically based on inbound triggers such as e-mail and SMS text messages, can be scheduled to run automatically, can be initiated by a call center agent or a web user, or can be initiated by a third-party application via the Intelligent Series REST Web API. MergeComm can deliver content to call center clients via any of the available Intelligent Series contact methods. With today’s mobile work force, servicing client needs means supporting them in their workflows in ways that were until recently not feasible. In the past, messages were delivered to clients as a one-way transmission with minimal ability to provide feedback. This often consisted of several discrete steps in order to close out the message. But now, thanks to the pervasiveness of wireless and smartphone technology, combined with the power and automation of Amtelco’s Intelligent Series, MergeComm, miSecureMessages, and miTeamWeb, these steps are seamlessly combined and serve to enhance the workflow rather than impede it. Amtelco’s miSecureMessages encrypted text messaging solution opens a new world of interactive communications for call center clients. Call centers can send messages securely to client smartphones and tablets, with the ability to receive immediate feedback in the form of delivery and read receipts, and receive replies from their clients. Not only can a message be delivered to clients securely and efficiently, clients also have the ability to change their status, view on-call schedules, and send messages directly to others. Combine Amtelco’s miSecureMessages app with the miTeamWeb mobile-friendly web portal and clients have full access to all of their call center data and functions directly and immediately from their mobile devices. As you analyze your client relationships, strive to identify the critical components of their workflows that can be improved by your services. Look for ways that new technology and software can be applied, perhaps in ways not previously anticipated. This is the key to innovation. This is the key to seizing an opportunity. We encourage anyone interested in soft switching, virtualization, cloud deployment, automated dispatching, scripting, and web and mobile solutions to contact Amtelco. We are excited about what the next 40 years will bring us and look forward to working with each of you. Kevin Beale is vice president for software, research and development, at Amtelco, a developer and supplier of call center and communications solutions located in McFarland, Wisconsin. Contact him by email at kbeale@amtelco.com. The optional Infinity SmartJoin feature enables customers to audit and join a call using a DID number and a four-digit code. The customer can audit the call and then press the digit 5 on a phone keypad to enter the conversation. When a caller is on the line, the Infinity SmartJoin feature enables the operator or system to send a four-digit code to the customer using virtually any Contact Method, including pager, Short Message Service (SMS), miSecureMessages (MSM), and email. The code consists of the last four digits of the Unique Call Number (UCN) in Infinity. The customer then calls a predetermined DID number and is prompted by Infinity to enter the UCN of the call. The customer enters the four-digit code and is placed in audit mode for the call. The customer has the ability to press the digit 5 to enter the conversation. If the customer presses 5, an audible tone is played to the operator to indicate the customer has joined, and the on-screen call state changes to conference (conf). Call handling for the operator is consistent with any call in the conference state. The operator can place each party on hold, leave the conference with the caller and customer patched, or disconnect the call. Infinity SmartJoin is an optional feature. For information about purchasing SmartJoin, contact your Amtelco sales representative at 1-800-356-9148. To confirm that the SmartJoin system feature is enabled on your system, open the Infinity Supervisor application. Click System Settings to display the System Configuration pages. The System Configuration window is displayed by default. 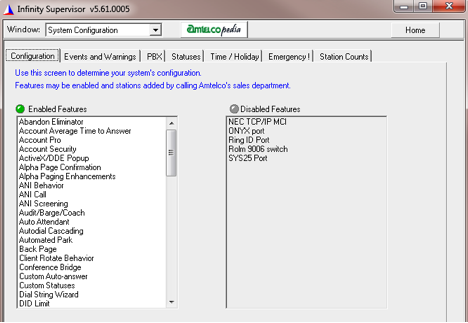 The enabled features are listed under the Configuration tab. If the SmartJoin feature is enabled, “SmartJoin” is listed under Enabled Features. The next step in setting up the SmartJoin feature is to configure a SmartJoin client account. The SmartJoin client account is used to prompt the caller for the four-digit UCN to connect to the call. A DID number is required; the client source behavior must include the UCN Audit behavior. Account behaviors are configured in Infinity Supervisor Client Setup pages. 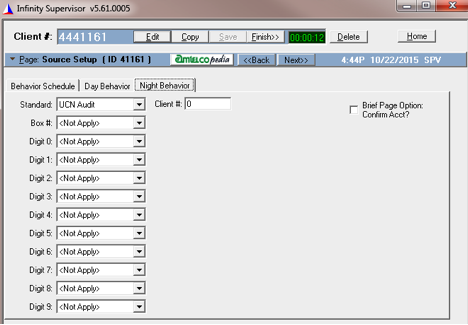 Open Infinity Supervisor and click Client to open the Client Setup pages. Type the client account number of the account that you want to use for the SmartJoin behavior and press the ENTER key. A custom greeting can be used on the account to pre-announce instructions or to hide the UCN Audit behavior and require an un-announced digit to enter the UCN audit behavior. In the following example, a simple configuration is used with UCN Audit as the default behavior. The UCN Audit behavior prompts the customer to enter the four-digit UCN. If the caller enters the correct code, Infinity connects the customer to the call in audit mode. The customer can press the digit 5 to join the conversation. With the optional Intelligent Messaging feature, it is possible to display the last four digits of the UCN in a message script and send the digits to the customer. This function returns the last four digits of the UCN. A new Find Method option allows you to select Contact Methods based on a contact’s current status. Another new Find Method option allows the script programmer to specify the name of a status in the script and to select Contact Methods that have been assigned to that status. A new check box labeled “Send to all methods found” provides the option to dispatch to every Contact Method found rather than just to the first Contact Method found. The Contact Send response elements work in conjunction with the For Each Contact response element to dispatch a message to a group of contacts selected from an IS Directory or an IS Directory OnCall schedule. Each of the Contact Send response elements has Find Methods settings located on the General Properties page. The Find Method properties determine which Contact Method is used to dispatch the message. The Find Method properties determine which Contact Methods are used to send the message. Match Text is the text to compare to Contact Method names when using the “Match entire method name” option or the “Match any part of method name” option and status names when using the “Find methods using specified status” option. By default, the field type is set to Text. To change the type of information that can be stored, click the field type, select “Change To” from the menu, and select a field type from the submenu. 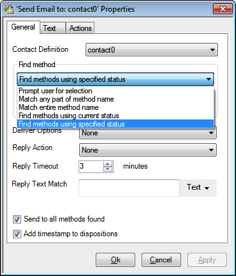 The “Send to all methods found” check box is used to dispatch a message to multiple Contact Methods. Select this check box to send the message to all Contact Methods that match the Find Method indicated. Clear this check box to send the message to the first Contact Method that matches the Find Method indicated. The Contact Send Email response element only dispatches to Email Contact Methods. The Contact Send Fax response element only dispatches to Fax Contact Methods. The Contact Send Page response element only dispatches to TAP Pager, WCTP Pager, and SNTP Pager Contact Methods. The Contact Send Secure Message response element only dispatches to Secure Messaging Contact Methods. 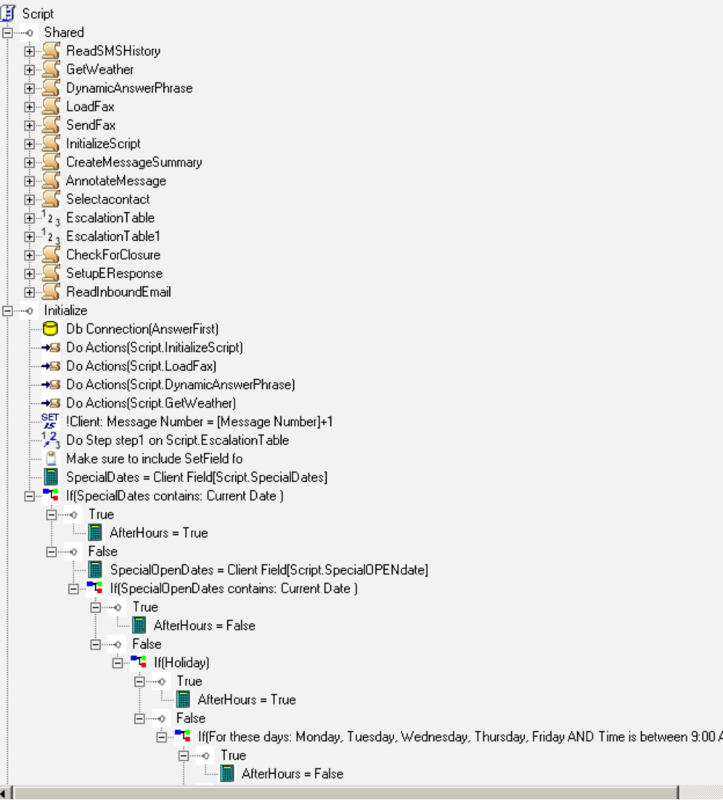 The Contact Send SMS Page response element only dispatches to SMS Contact Methods. The Contact Send Vocera Page response element only dispatches to Vocera Contact Methods. More information about Contact Send response elements is provided in the Directory Contacts section of the Intelligent Series Supervisor Reference Guide. An option in the Infinity Telephone Agent application makes it possible to move the Hi-Resolution controls to a separate Widgets window that can be resized, repositioned and even moved to a second monitor at the agent workstation. The ability to display Specials and IS Info Pages also has been added to the Hi-Resolution controls. Buttons along the top of the Hi-Resolution window display each of the controls. Each control can be resized and repositioned. There also is a “Windows” menu with commands to Cascade, Tile Vertical, Tile Horizontal, and Close All of the controls. The Hi-Resolution options are located in the Infinity Telephone Agent Setup Control Panel. 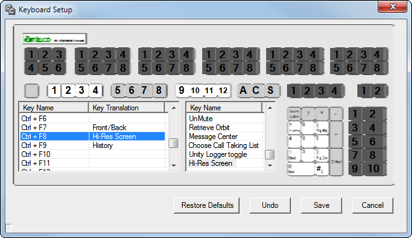 Press the CTRL + F12 keys at the Infinity Telephone Agent login prompt to display the Setup Control Panel. Expand the Features category and then click “Hi-Resolution” to display the Hi-Resolution settings. Make sure the Hi-Resolution check box is selected. If it is not selected, select it. Select "Collapsible" for the Hi-Resolution Display Type. Show Hi-Res items on their own screen? A check box labeled “Show Hi-Res items on their own screen” is displayed. 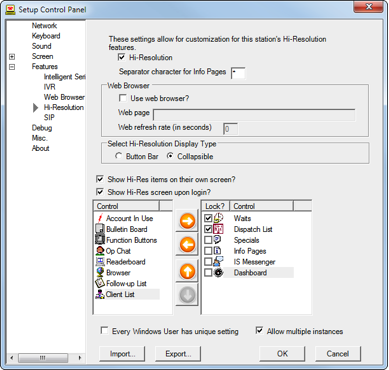 Select this check box to display the Hi-Resolution widgets in a separate window. A keyboard key or function button must be programmed to open the Hi-Resolution Widgets window. If you have not programmed a key or function button, a dialog box is displayed when you enable the “Show Hi-Resolution items on their own screen” check box. Click the Keyboard Setup hyperlink to open the Keyboard Setup window of the Setup Control Panel. Click the Function Button Setup hyperlink to open the Function Button Setup window of the Setup Control Panel. The key action that opens the Hi-Resolution Widgets window is named “Hi Res Screen.” Add this action to one of the key combinations by dragging “Hi-Res Screen” from the Key Name column on the right to the Key Translation column next to a key combination on the left. The words “Hi-Res Screen” should be displayed in the Key Translation column next to the key combination that you selected. Click the Save button to save your changes. Then click the red X button to close the Keyboard Setup window. The key action that opens the Hi-Resolution Widgets window is named “Hi Res Screen.” Add this action to one of the on-screen buttons by dragging “Hi-Res Screen” from the Key Name column on the right to the Button Translation column on the left. The words “Hi-Res Screen” should be displayed in the Button Name column and also on the selected button shown in one of the two button rows. Click the Save button to save your changes. Then click the red X button to close the Function Button Setup window. Show Hi-Res screen upon login? The Controls list determines which controls are available in the Hi-Resolution window. To add a control, select the control in the list on the left and then click the right arrow to move the control to the list on the right. To remove a control, select the control in the list on the right and then click the left arrow to move the control to the list on the left. You do not have to lock any of the controls when displaying the Hi-Resolution widgets in a separate screen. When you have finished configuring the Hi-Resolution settings, click the OK button to save the settings. The Infinity Telephone Agent Login Screen is displayed. 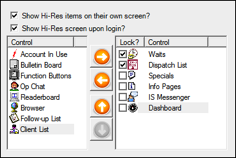 If the “Show Hi-Res screen upon login” check box is selected, the Hi-Resolution controls are displayed in a separate Widgets window when an agent logs into Infinity Telephone Agent. The agent also can display the Hi-Resolution window by pressing the key combination assigned to Hi-Res Screen in Keyboard Setup or the “Hi-Res Screen” function button configured in Function Button Setup. The agent can resize the Widgets window by dragging its edges and can reposition the window by dragging its title bar. The window also can be dragged to a second monitor on workstations with dual monitors. To display a control, click the name of the control in the button bar along the top of the Widgets window. Each control can be resized and repositioned. To close the Widgets window, open the File menu and select the Exit command. 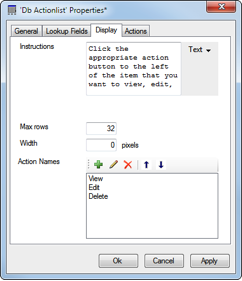 The Action List database response element presents a Database Action window containing a list of database fields with a customizable set of action buttons. 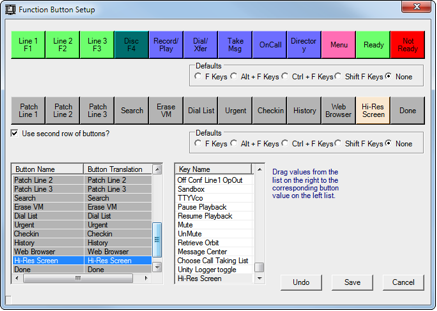 The element allows the script programmer to label the buttons and script the action to be performed when a button is clicked. The programmer can also customize the instructions displayed at the top of the window. The settings on the General and Lookup Fields pages of the Action List database response element properties are similar to the settings in the Picklist database response element properties. 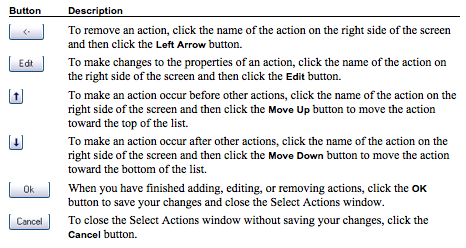 The Display page contains settings for customizing the Instructions field and settings for creating action buttons. Actions can be assigned to each action button using the hyperlinks on the Actions tab. The action buttons also are represented as nodes in the Tree View of the script editor. Connection: Click the Connection menu and select the name of the database connection that this element will use. A database connection must be created with a Connection database response element before an Action List element can be used. Table Name: Type the name of the database table or stored procedure to use for the search. Type: Click the Type menu and choose whether you want to access a table or a stored procedure. 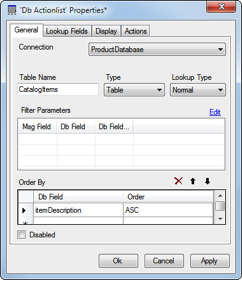 Lookup Type: If you are accessing a table, you can use a normal search or you can click the Lookup Type menu and select a function to perform on the table data. Click the Edit hyperlink to open the Edit ‘Filter Parameters’ Values window. Enter filter parameters to narrow the search to records matching information from the message script. If you are using a stored procedure, make sure that the parameters you specify match the parameters that the stored procedure accepts. Msg Field: Click to display the names of the fields in the message script. Select the message fields that will be compared to the database information to filter the search. 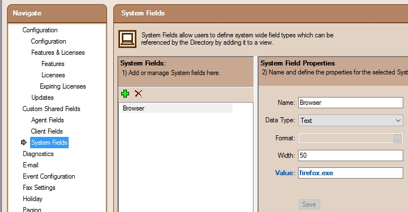 Db Field: For each of the Msg Fields selected, type the name of the field in the database that will be searched. When you have finished editing filter parameters, click the Ok button to save the changes and close the Edit ‘Filter Parameters’ Values window. If you are using a table, specify the order in which you would like to sort the search results. If you are using a stored procedure, Order By is not available because sorting is controlled by the procedure. Db Field: Type the name of the field in the database that will be used to sort the search results. Order: Select the order in which responses will be displayed according to alphabetical or numeric sequence. The choices are ascending (ASC) and descending (DESC). Disabled: The Disabled check box prevents use of the database when running the script. This feature allows you to test the rest of your response elements without access to a database. Lookup Fields are the fields that will be returned by the search. Database fields assigned a Caption will be displayed to the agent and script user in a list in the Database Action window. When the agent or script user clicks one of the records in the list, the contents of each field in that record can be routed into Msg Fields in the script. Msg Field: Click to display the names of the fields in the message script. Select the message fields that will store the data from the record that the agent or script user chooses. 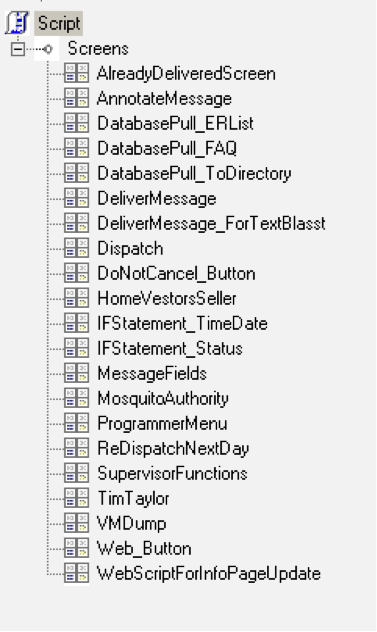 Note: Each field must be created somewhere in the script before it can be selected as a message field. This means you may have to skip ahead to the configuration of the screens that will handle the results of the database lookup before you finish configuring the Action List element. Db Field: For each of the Msg Fields selected, type the name of the field in the database from which the information will be gathered. 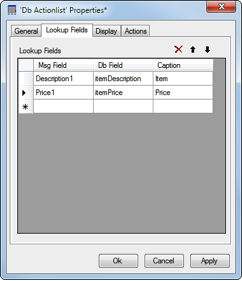 Caption: Type a heading for each column in the action list that will be displayed to the agent and script user. If the Caption is left blank for a database field, the contents of that field will not be displayed to the agent and script user but can still be assigned to a message field. 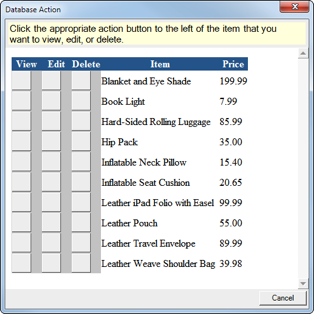 The Display page contains settings for creating action buttons and configuring the Database Action window. Instructions: The text in the Instructions field will be displayed at the top of the Database Action window. Enter the text you want to display to agents and script users. Max rows: The Max Rows property determines the maximum number of rows that will be displayed in the action list. This value cannot exceed 32. Set Max Rows to the number of matches that you want to display if you want to limit the number of matches that are shown to the agent or script user. Set Max Rows to 0 (zero) to display all matches. Width: This value determines the width of the Database Action window in pixels. Action Names: Use the Action Names Toolbar to create action buttons that will be displayed in the Action List. Each action button created generates a node in Tree View and a hyperlink on the Actions page. Actions can be assigned to each action button using the hyperlinks on the Actions tab. The action buttons also are represented as nodes in Tree View. If you have made changes to the Action Names on the Display page and have not clicked the Apply button, the following message is displayed: “List of actions has changed, in order to edit actions current settings have to be saved.” If this message is displayed, click the Save Changes hyperlink to save the changes and the Actions page will be updated accordingly. 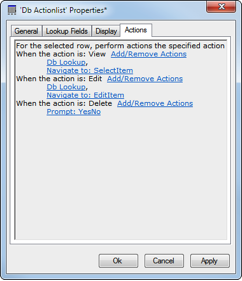 When the action is: A hyperlink is provided for each of the action buttons that were created on the Display page of the Action List properties. Click the Add/Remove Actions hyperlinks to add actions to the button.